Just the addition of a faux fireplace—no flame required—can make a space cozier. Somehow, even if it’s not operational, a fireplace is still imbues coziness in winter and architectural charm year-round. If you live in an apartment or modern abode, you may not have a wood-burning or electric fireplace to warm up by, but you’re not out of luck altogether. 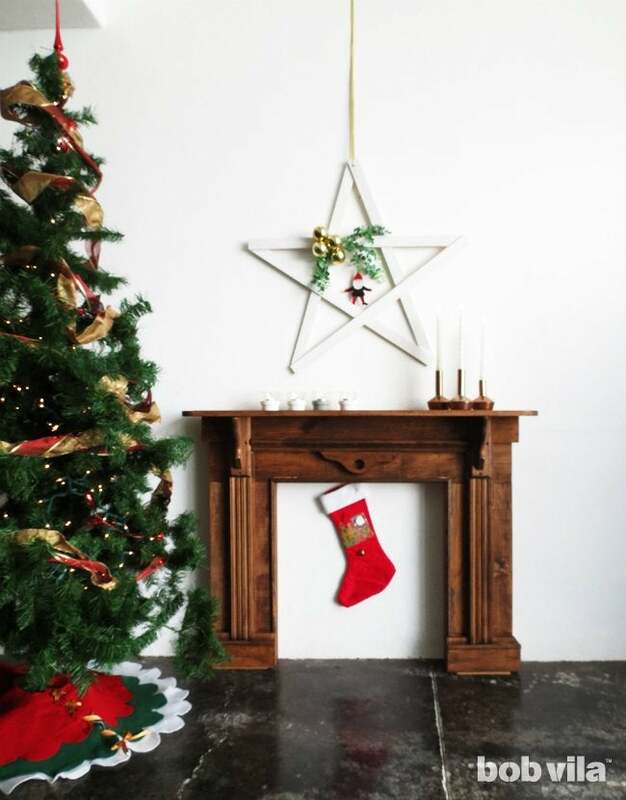 Follow these instructions to construct an ornate mantle for a faux fireplace to reinforce the holiday cheer—and provide just the spot to hang your stockings. 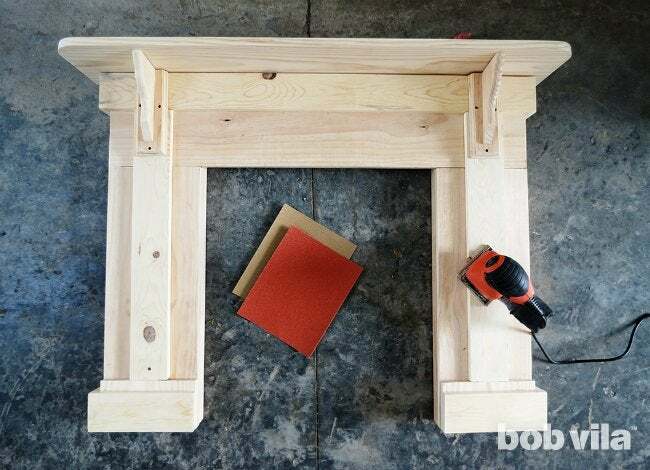 The 1×10 planks will make up the front surface of your faux fireplace, while the 2×2s connect to the back to add depth to the structure. Sand all of the edges on your fresh cuts. Lay the 43-inch plank on the floor and beneath it, at each end, place the 26-inch plank pieces perpendicularly to form a U-shape. Apply wood glue to the edges where the planks meet. Then, lay the 2×2s along the structure vertically so that they span top to bottom of the “U”, one along each edge of the vertical 1×10 planks. 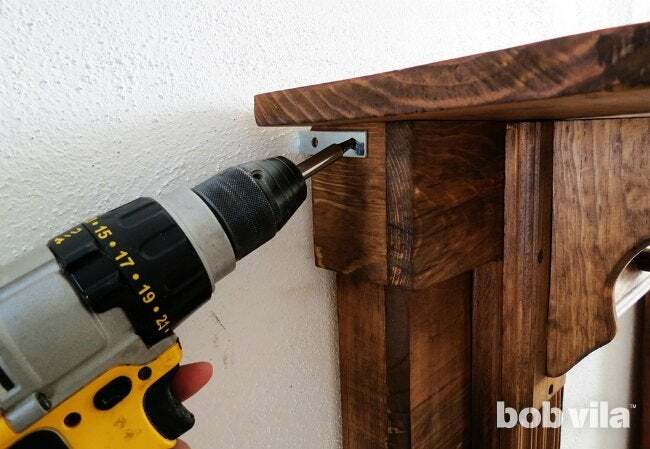 Pre-drill holes and use five 2-inch screws to fasten each of these 35-1⁄2-inch pieces to the wood boards. This side with the 2×2s will be the back of your faux fireplace. Flip the wood structure to so that its front is now facing up. 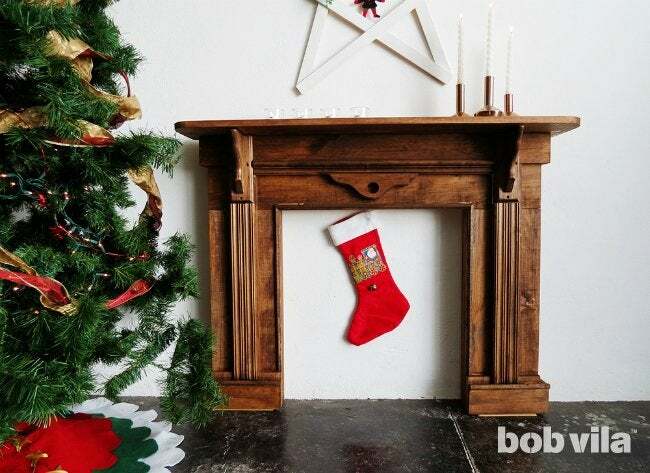 Now’s the time to add some ornamentation to your fireplace cut from the 1×4 plank. The first cut, 43 inches long, will be glued horizontally, aligned with the top edge of the fireplace. Next, cut two 27-inch pieces. Sand the edges to remove splinters before proceeding. 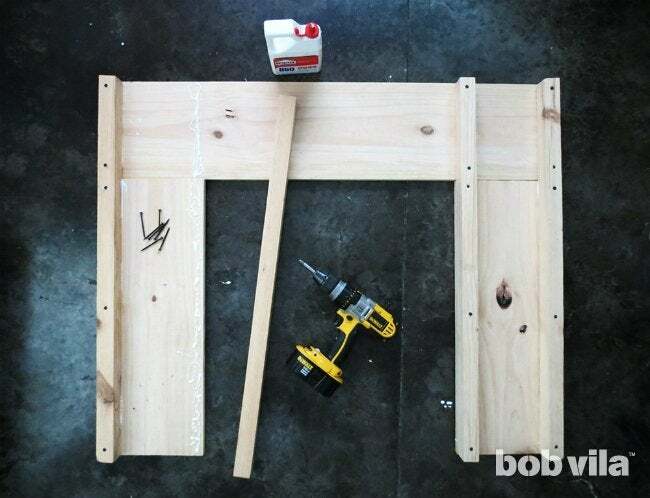 Use a ruler to center these on each side of 1×10 side (they should have 3-1/4 inches of space on either side), and glue them down so that the tops abut the top 1×4. You can use clamps here to press pieces firmly together while the wood glue cures. Then, add volume at the base of the chimney by giving it feet that slightly extend. Cut two 5-inch pieces from the remaining 1×10 plank and two 9-1⁄2-inch pieces from the 1×4 lumber. Stack one 9-1⁄2-inch-by-3-1⁄2-inch piece atop a 9-1⁄2-inch-by-5-inch piece so that their longer sides align, then glue. Repeat with the remaining cuts. Place a stack to the bottom of each side of the faux fireplace, at the open ends of the 27-inch pieces. 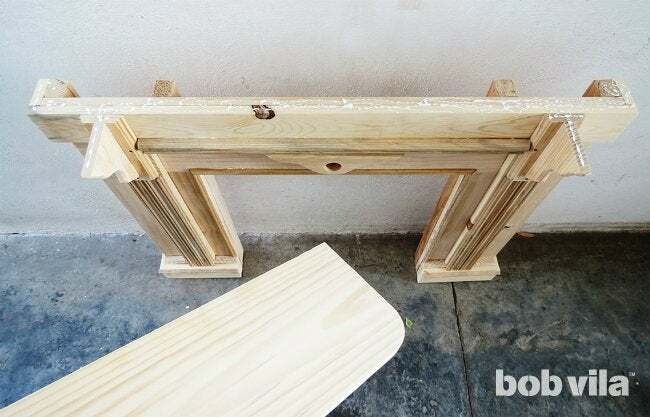 Align the mantle’s feet so that no wood extends past the base of the faux fireplace—it needs to be a flat surface in order to stand up later on—then glue and clamp each down. 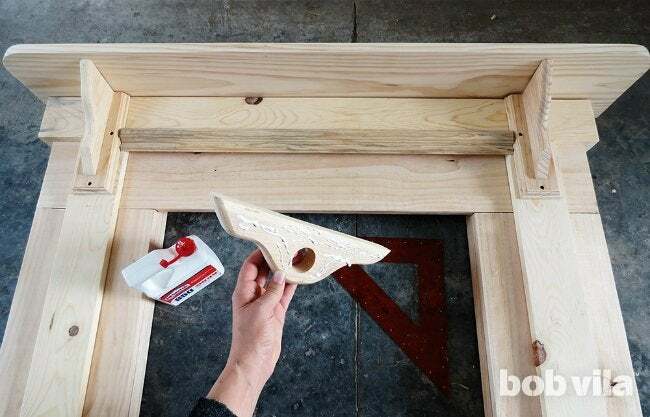 To support the board that will be the top mantle of your faux fireplace, fasten a 6″-deep wooden shelf bracket onto each side of the fireplace with glue and screws. We centered ours at the very top of the vertical 1×4s. Note: It’s important to choose brackets that don’t extend out more than 6 inches, otherwise you will not be able to adequately cover them with the mantle in a later step. Cut a 48-inch length of 1×10 for the top. To compliment the curves in the shelf brackets, we gave our mantle top a nicer edge by rounding two corners of the board. Place any round container (like a recycled plastic butter container) at the top left corner and trace its circumference in pencil, and use a jigsaw to cut along the quadrant of the circle closest to the corner. Erase the remaining three-quarters of the circle, and repeat at the top right corner. Rounded corners facing forward, center the mantle over the top of the faux fireplace with 2-1⁄2 inches overhang on either side. 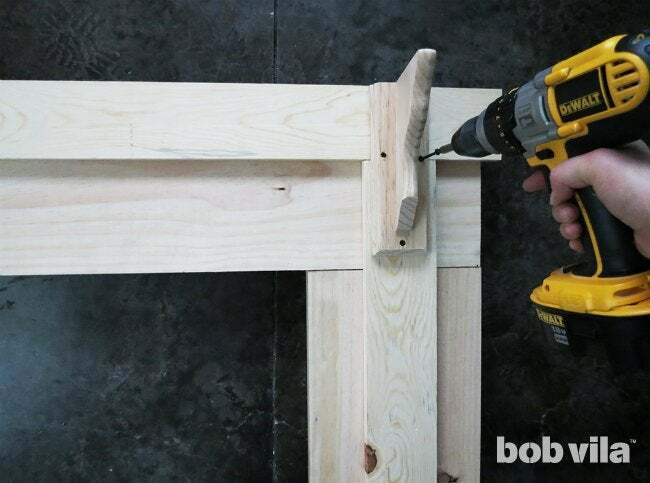 Glue it to the top of the structure, and hold it with clamps while the glue dries. Sand the near-finished fireplace with either paper or a palm sander. Start with 100-grit paper, and repeat with 150-grit. Inject even more personality into your project with some wood molding along the fireplace opening and atop the 1×4s. 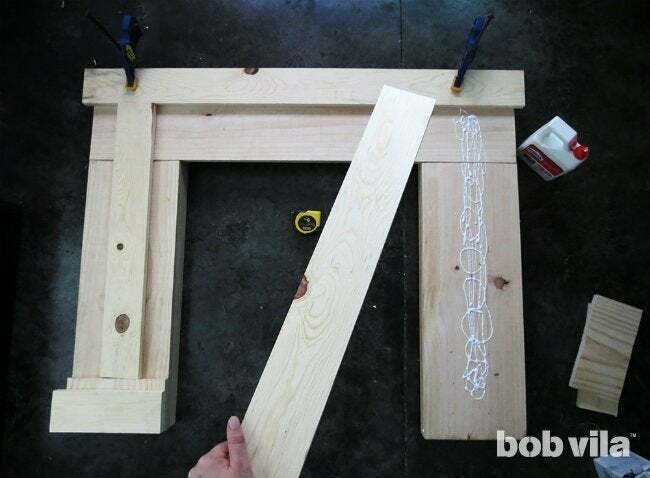 For the fireplace opening, cut three pieces of 1⁄2″-wide molding: two 27-1⁄2-inch lengths and a 25-inch length. Using a miter box, cut the tops of the 27-1⁄2-inch pieces to have mirroring 45-degree cuts; proceed to cut the ends of the 25-inch piece at 45-degree angles, each pointing away from the other. The 25-inch length should now fit with the 27-1⁄2-inch lengths to make a three-sided frame. For the sides, the exact length of 2″-wide molding needed to cover the 1×4s ultimately depends on the size of your chosen shelf brackets. Measure the vertical 1×4s’ exposed surface—from the bottom of the shelf brackets to the top of the mantle feet—and cut four identical pieces that length. Glue two side-by-side on each. As a finishing touch, we glued a 30-inch length of 2-1⁄2″-wide molding beneath the horizontal 1×4 and a wooden closet rod support in the very center. 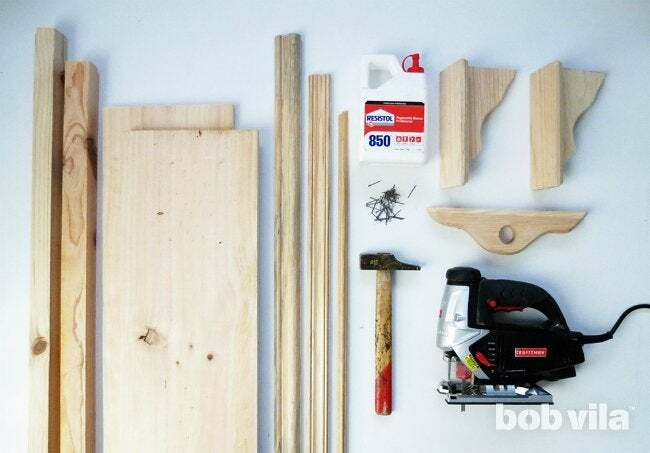 Hold each wooden piece with a clamp while the glue dries. 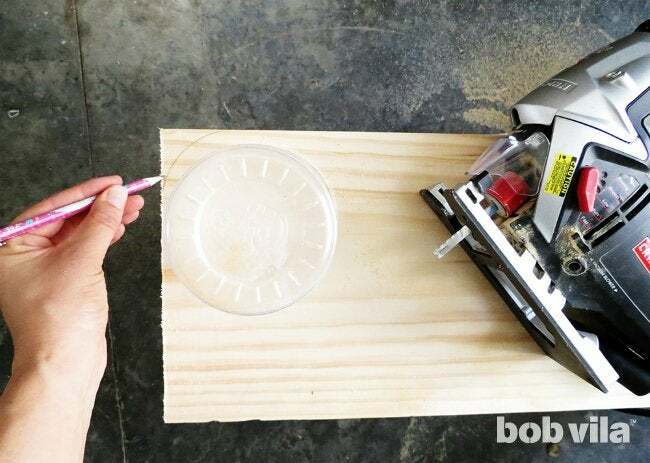 Once all of the glue holding the molding has dried, you can give an extra sanding to remove any leftover glue. 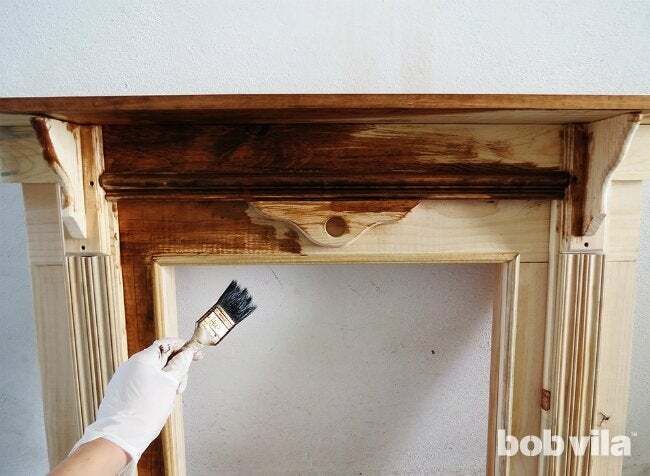 Wipe away the dust with a wet cloth so that you stain your fireplace in a hue of your choice. (Two coats promises the best color.) After you’ve waited the stain’s recommended dry time, top with a coat of varnish to protect the wood. Now that your faux fireplace is built, move it into the living room. It doesn’t need to find a permanent home on any one wall, but it is best to fasten it so that it won’t topple when you place objects on its mantle. Lean the fireplace wherever you intend to place it, and slide a metal corner brace around one edge just beneath the mantle top, where they’ll be barely visible. Lift the fireplace and screw half of the brace into the wall. Lean the fireplace one more time against the wall so that you can find where to affix the second metal corner brace. Once both are in the wall, simply screw the exposed ends into the sides of the fireplace. All that’s left is to fill your new faux fireplace with candles or string lights to mimic the cozy glow of lit kindling.